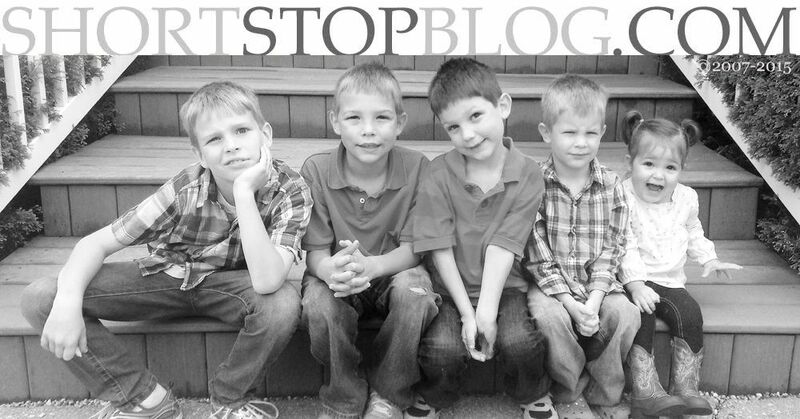 Would you believe that I have never posted a ground beef recipe on this blog? Out of the hundred and some recipes filling up the archives, not-a-one of them contains ground beef. I don't know what it is with me and ground beef. It's not that I don't like it, it's just that I don't like it on most days. I LOVE a big, fat, juicy burger. About three times a year. But, the rest of the time, I use Italian sausage in my spaghetti sauce, lasagna, etc. - and just never buy ground beef. When we were at my in-law's over Thanksgiving, Mom made the boys tacos while I snuck off for dinner with my college friends. My boys LOVED them. I had never made tacos for them before, and they loved having "boats" for dinner. When we got home from our trip, the ONLY thing the boys wanted me to buy at the grocery store was "boats". Please, please, please, Momma, can we have boats for dinner? Pleeeeeease. So, we had "boats". Tacos - good ol' Ortega. Because it was on sale in larger packages, I made a full two pounds of taco meat, but we only ate half for our taco night. So, with the leftover taco meat, I created this little recipe. 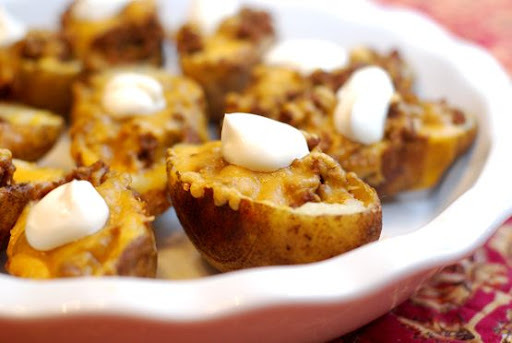 SG's Chili Cheese Potato Skins. I made my traditional SG's Potato Skins recipe, but gave them a Mexican twist. I piled up our leftover taco meat and a ton of cheese. WHOA, baby. I loved these. Ground beef and all. You could use ground turkey instead of beef, leftover chili, Date Night Fajita Nacho chicken, black beans, refried beans - you can create any kind of Mexican potato skin you like. Then serve them with guacamole, salsa, and sour cream. And, they're perfect party food. Here's to my first ground beef recipe. It only took me 2 1/2 years to post one. Wash and scrub 3 pounds of small/medium baking potatoes. Place on baking sheet and pierce each potato several times with a fork. Bake at 425 degrees for 1 hour. Brush melted butter onto both sides of each potato half (including skin side) and sprinkle with salt. Bake in 425 degree oven for 8 minutes. Remove potato skins from oven. 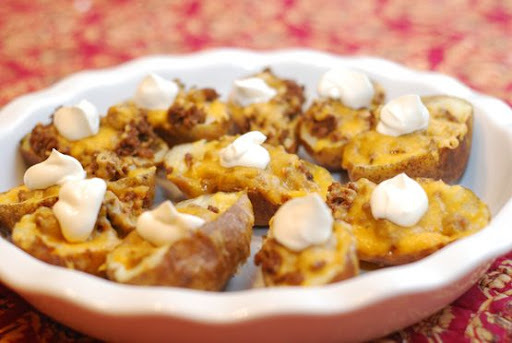 Top potato skins with taco meat or chili (or black bean or refried beans or grilled Mexican-style chicken). Add generous amounts of cheese on top. Return the potato skins to the oven for 5 minutes - or until cheese has completely melted. If you've got a good ground beef recipe, I'd love to hear it. ohymgosh girl~~~~~~ (wait have I told you this before)??! dave came up with this little recipie we use--it is cheap and easy --ohmygosh soo delictable! he got those little phyllo cups--do you know they come in a package where they dont have to be frozen!??!?! so we browned ground beef onions and even corn once and filled those little bad boys up with ground beef with taco seasoning and piled them HIGH with cheese!!!!! they are so bite sized and delicious and easy!!!!!!!!!!!!! and to die for--the crunch of the phyllo cups!! YUM!!!! oh the most important part is you put the phyllo cups in the oven for 5 minutes they get crunchy ! ughhhhhhhhhhhhhh to DIE for! can you tell I like them?!?!? I was shocked when you told me you never use ground beef. Not sure why, but I was. This sounds yummy and delightful though. I typically use ground beef for enchiladas, casserole, and lasagna... all things you've found substitutes for. We do have an occasional meatloaf around here, though it's been quite awhile. And I need to make tacos more often... I always do enchiladas. You are too funny. Three cheers for ground beef!!! This looks so yummy! I'd top mine with salsa instead of sour cream. We use ground turkey for our chili and spaghetti, but this is a great idea for ground beef. You Have to try my dad's Chili I'll get that recipe for you. Those look spectacular. Seriously, my tummy gave a small "Amen" when I saw the picture. I like ground beef, especially a good meatloaf (Paula Dean's smokey apple cinnamon meatloaf is AWESOME!!!! ), but most of the time I prefer chicken or pork to ground beef. It's just so much less grease than ground beef. Yummy. I am not a big fan of ground beef either. I don't even like fat, juicy hamburgers. Or meatloaf. I use ground turkey for spaghetti, chili, tacos, lasagna, etc. We use the fajita chicken for all kinds of things now! I have husband grill 8 breasts at a time and we freeze the leftover to use in enchiladas and soups. We all love it.